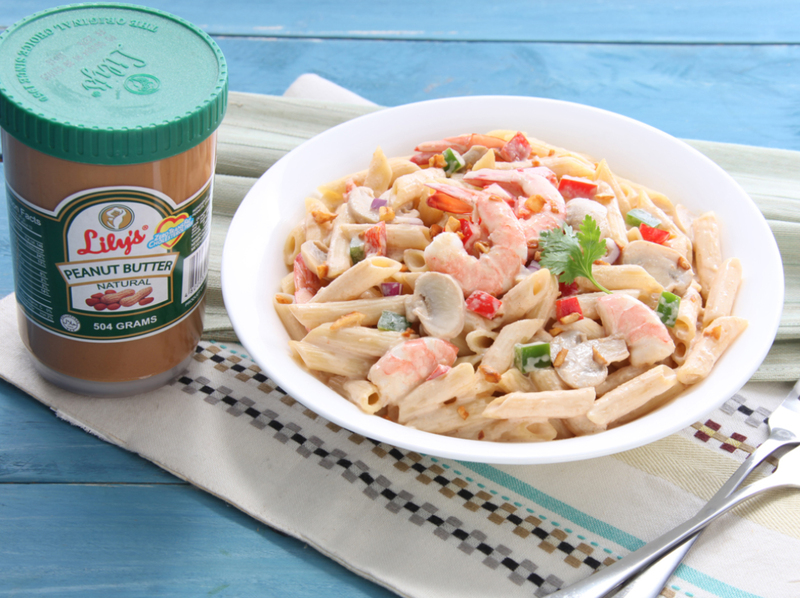 A repertoire of Asian ingredients merged with a western staple, this pasta with shrimps and Lily’s Peanut Butter finished off with mushrooms, cilantro, garlic, and bell pepper is a sure dinner winner. Reminiscent of Thailand’s Pad Thai, this dish isn’t just daringly yummy; it’s a balanced meal of carbohydrates and protein packed with vitamins B12 and E, selenium, and phosphorus. Heat oil in a pan and saute onion and garlic until onion is translucent and garlic is golden. Add in the shrimp and continue sauteing until slightly pink. Stir in the all-purpose cream, water, Lily's Peanut Butter, and broth cube until everything is well incorporated. Add bell pepper, sesame oil, mushrooms, and 2 tablespoons cilantro. Season with salt and pepper to taste. Serve the sauce tossed in cooked pasta and topped with toasted garlic bits and cilantro.